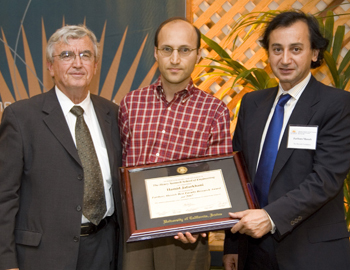 Michael Green, Ph.D., associate professor of electrical engineering and computer science, received the Fariborz Maseeh Best Teaching award, and Maria Feng, Ph.D., professor of civil and environmental engineering, and Hamid Jafarkhani, Ph.D., professor of electrical engineering and computer science and deputy director of the Center for Pervasive Communications and Computing, were each honored with the Fariborz Maseeh Best Faculty Research award. Green's current research is in analog/mixed-signal integrated circuit design, particularly for applications in high-speed broadband communications. His work in this field has had significant impact in the efficacy of the infrastructure of optical communication networks, including the development of the first CMOS integrated circuits used in optical communications that operate at 10 Gigabits per second. His other areas of expertise include design of integrated filters and theory of nonlinear circuits. Green has won numerous awards, including the Guillemin-Cauer award for the best paper appearing in IEEE Transactions on Circuits and Systems in 1993, and the W.R.G. Baker prize for the most outstanding paper appearing in any IEEE publication in 1993. Green received a bachelor’s degree in electrical engineering from UC Berkeley, and a master’s and Ph.D. degree from UCLA in electrical engineering. Feng joined the UC Irvine faculty in 1992, and has a Ph.D. in mechanical engineering from the University of Tokyo. Her primary research interest is the safety and security of civil infrastructure systems, focusing on multidisciplinary science and technology in smart structures, advanced sensors and nondestructive evaluation devices, structural health monitoring, and damage detection. Feng is considered one of the pioneers in structural health monitoring research, developing innovative fiber optic and other advanced sensors, as well as sophisticated health diagnosis algorithms and software. She has implemented real-time structural health monitoring in structures, including the California Institute for Telecommunications and Information Technology (Calit2) building on the UC Irvine campus, three Caltrans highway bridges, and the high-profile Vincent Thomas Bridge in Long Beach. Feng has also made significant contributions to the emerging smart structures research fields. Notable examples include the friction controllable sliding isolation system and the mega-sub control system, which she invented for seismic and wind protection of buildings and bridges. 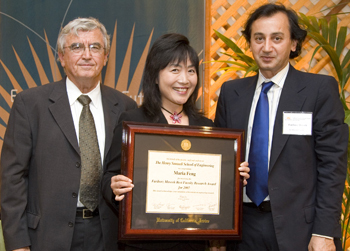 Feng has received numerous national and international awards, including the Early Faculty Career Award (CAREER) from the National Science Foundation, and the Best Presentation Award from the Society of Instrument and Control Engineers, . She is also the recipient of four prestigious honors from the American Society of Civil Engineers: the Collingwood Prize, the Alfred Noble Prize, the Charles Pankow Finalist Award for Innovation, and the Walter L. Huber Prize for Civil Engineering Research. Jafarkhani currently focuses his research on the theoretical and practical challenges of designing systems that use multiple antennas. He has also been involved in developing data compression algorithms, especially for image and video coding, and his recent work in this field concerns the transmission of multimedia information over wireless networks and the Internet. He is also interested in developing new coding schemes and network protocols that improve end-to-end recovery and enhance the quality of service for video, cross-layer adaptation, network connectivity, and power-aware wireless network protocols, especially for networks with multiple-antenna nodes. Additionally, Jafarkhani is looking at optimizing resources across different layers of a wireless network. Prior to joining UC Irvine, Jafarkhani was part of the AT&T Labs-Research as a senior technical staff member in August 1997, and was later promoted to principle technical staff member. While at AT&T Labs, he and his colleagues invented "space-time block coding," which has become an active area of research and is widely used in practice to improve wireless transmission quality. 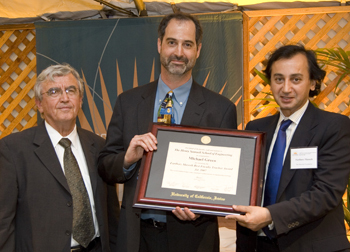 His many honors include the best paper award for the Institute of Electrical and Electronics Engineering (IEEE) International Symposium on Advances in Wireless Communications in 2002, a National Science Foundation Career award in 2003, the UC Irvine Distinguished Mid-Career Faculty Award for Research in 2006, and the 2006 IEEE Marconi Best Paper award in Wireless Communications. Jafarkhani was also an editor for the IEEE Transactions on Wireless Communications from 2002-2007, and an editor for the IEEE Transactions on Communications from 2005-2007, before becoming an area editor for the IEEE Transactions on Wireless Communications in 2007. He is an IEEE Fellow and author of the book “Space-Time Coding: Theory and Practice.” Jafarkhani received a bachelor’s degree in electronics from TehranUniversity, and an M.S. and Ph.D. degree in electrical engineering from the University of Maryland at College Park.